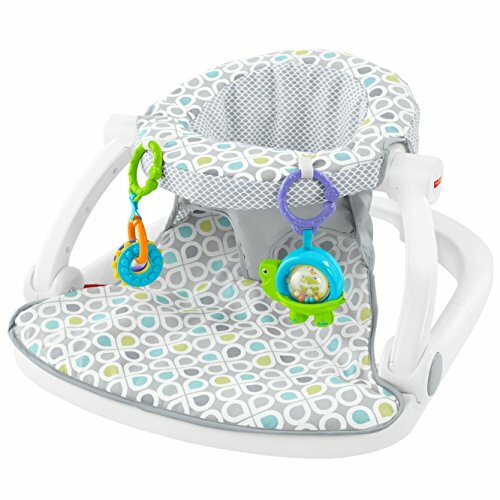 The Fisher-Price Sit-Me-Up Floor Seat is cute, convenient, and it helps support little ones as you sit them up to interact with the world around them (Hello, world.). The soft fabrics and wide base help little ones relax in cushy comfort. And the best part It folds flat-making it easy to store or take with you on the go. Your little one will love playing with the linkable toys (they're turtle-y cute. ), and you'll love how easy it is to clean-just remove the seat pad and pop it in the washing machine. Where development comes into play Security & Happiness: A comfy and supportive upright seat on a wide, sturdy base lets your baby see and interact with their surroundings. Gross Motor: As babies reach for the linkable toys and pull them up, they're helping to strengthen their gross motor skills. Curiosity & Discovery: Two linkable toys within reach to teethe, clack & spin help keep your baby entertained at home or on the go.